We’ve had so many requests to create a skirt to match the Helsinki top…so, we did. This easy care outfit is made of soft, light-weight knit with a fun raised texture. Oh, and did we mention that it doesn’t wrinkle? The elastic waist skirt with two deep pockets make it a breeze to slip in and out in a hurry. Easy breezy, relaxed fitting front zip dress is made of unique raised textured chiffon. Fully-lined in light as a feather knit make this ideal for ease and comfort. 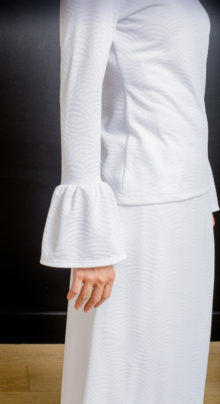 The split neck and contrasting placket with button cuff sleeves create an elegant and contemporary LDS Temple dress. You’ll love the forgiving fit and generous set in sleeves. 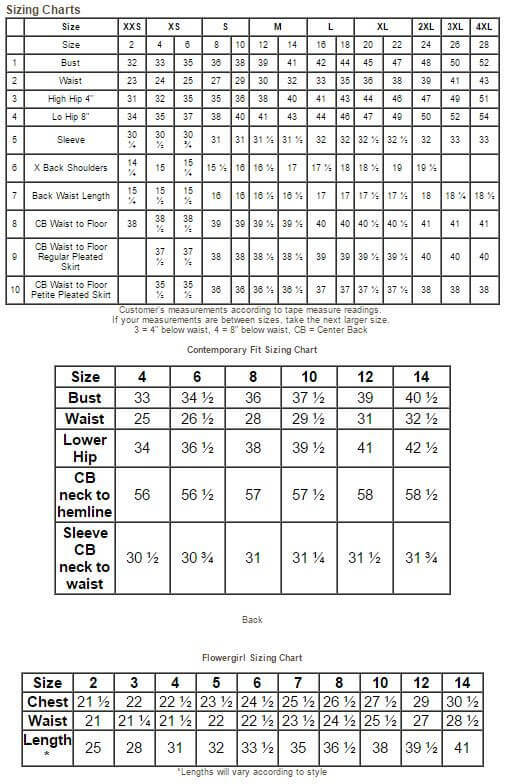 *100% Polyester *Machine washable/ drip dry *Two generous side seam pockets *Made in USA FIT HINT- Your Bust Measurement is most important for this dress, don’t worry about other measurements. Go off Size & Bust! If you’re looking for a comfy, easy care dress that slides easily over head, this is the dress for you. We’ve added box pleats to the front and back of this fit and flare dress for a perfect fit. Stretch fabric is forgiving, yet light-weight with a fabulous texture. 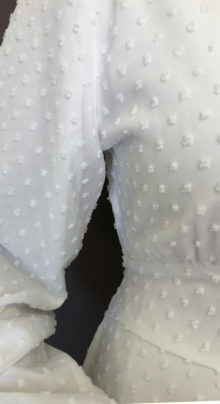 And, oh yes, it has two traditional White Elegance deep pockets. This simple, ageless, soft textured knit dress has a zipper down the back and sheering around the natural waist. The unique fabric has just the perfect amount of stretch for comfort and ease. Looking for a fitted dress that fits YOU perfectly? This is it. 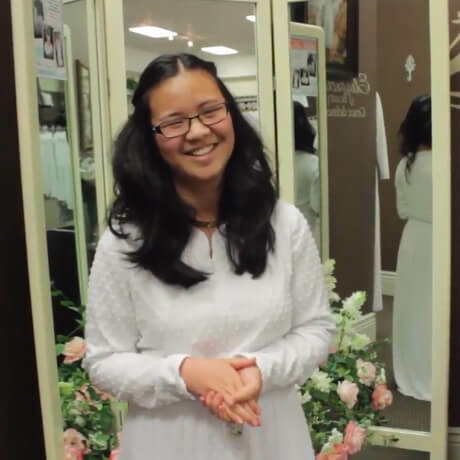 The Prague LDS Temple dress is actually lose fitting then ties to YOUR perfection. Oh, happy day. With it’s contemporary styling and fabulously fresh fabric, you can’t go wrong. Five button front makes it easy to slip on and off. Available in Swiss dot as well. If you love separates and cotton, then you’ll love this new 100% soft cotton skirt and top. Fitted through the bust with the perfect amount of flare through waist and hips. 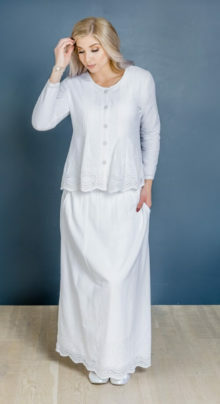 Front buttons make it a breeze for dressing and the elastic waist skirt make it oh so comfortable. Note the coordinating eye-let trim on the bottom of the skirt and the two nice deep pockets. Fully-lined. You’ll want a set for the Temple and a set to mix and match with your other favorite wardrobe pieces. White is always in style whether it’s with jeans or sweaters. 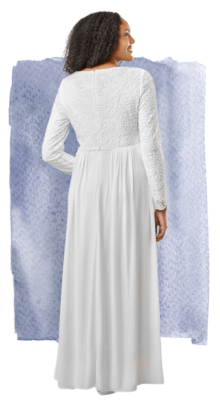 Soft, comfortable, easy-care knit dress with ruched band at the waist with contemporary neckline and fuller sleeve. As beautiful in the back as the front. Easy over the head fit. Two pockets.